Another year is passing by and yet Thanksgiving is here again to remind us to be truly thankful and appreciate the things we have. Let us take a moment to give our special gratitude to all of you for being awesome and supportive clients during this whole year. 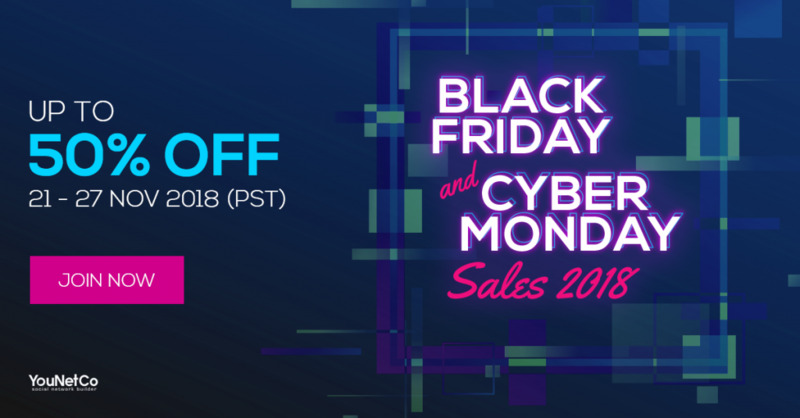 And as a token of appreciation, we are overjoyed to light up your shopping season with Black Friday and Cyber Monday sale, YouNetCo biggest promotion of the year. The promotion is held from Nov 21st to Nov 27th, 2018 (PST). We are offering discounts on all our products and packages purchased on phpFox Store. In particular, you can redeem for purchases on all phpFox apps, mobile app, templates, and packages. So don’t wait until the last minutes to grab these amazing deals while they last! Have any questions? Please contact us in the Client Area or drop a message at Contact form. Have a pleasant Thanksgiving and Happy shopping with our Black Friday and Cyber Monday sale!